That is the total number of tags created by 168 volunteers after processing 3,909 satellite images in just five days. A quarter of a million tags in 120 hours; that’s more than 2,000 tags per hour. Wow. As mentioned in this earlier blog post, volunteers specifically tagged three different types of informal shelters to provide UNHCR with an estimate of the IDP population in the Afgooye Corridor. So what happens now? Our colleagues at Tomnod are going to use their CrowdRank algorithm to triangulate the data. About 85% of 3,000+ images were analyzed by at least 3 volunteers. So the CrowdRank algorithm will determine which tags had the most consensus across volunteers. This built-in quality control mechanism is a distinct advantage of using micro-tasking platforms like Tomnod. The tags with the most consensus will then be pushed to a dedicated UNHCR Ushahidi platform for further analysis. This project represents an applied research & development initiative. In short, we certainly don’t have all the answers. This next phase is where the assessment and analysis begins. In the meantime, I’ve been in touch with the EC’s Joint Research Center about running their automated shelter detection algorithm on the same set of satellite imagery. The purpose is to compare those results with the crowdsourced tags in order to improve both methodologies. Clearly, none of this would be possible without the imagery and invaluable support from our colleagues at DigitalGlobe, so huge thanks to them. And of course, there would be no project at all were it not for our incredible volunteers, the best “Mapsters” on the planet. Indeed, none of those 200,000+ tags would exist were it not for the combined effort between the Standby Volunteer Task Force (SBTF) and students from the American Society for Photogrammetry and Remote Sensing (ASPRS); Columbia University’s New Media Task Force (NMTF) who were joined by students from the New School; the Geography Departments at the University of Wisconsin-Madison, the University of Georgia, and George Mason University, and many other volunteers including humanitarian professionals from the United Nations and beyond. As many already know, my colleague Shadrock Roberts played a pivotal role in this project. Shadrock is my fellow co-lead on the SBTF Satellite Team and he took the important initiative to draft the feature-key and rule-sets for this mission. He also answered numerous questions from many volunteers throughout past five days. Thank you, Shadrock! It appears that word about this innovative project has gotten back to UNHCR’s Deputy High Commissioner, Professor Alexander Aleinikoff. Shadrock and I have just been invited to meet with him in Geneva on Monday, just before the 2011 International Conference of Crisis Mappers (ICCM 2011) kicks off. We’ll be sure to share with him how incredible this volunteer network is and we’ll definitely let all volunteers know how the meeting goes. Thanks again for being the best Mapsters around! 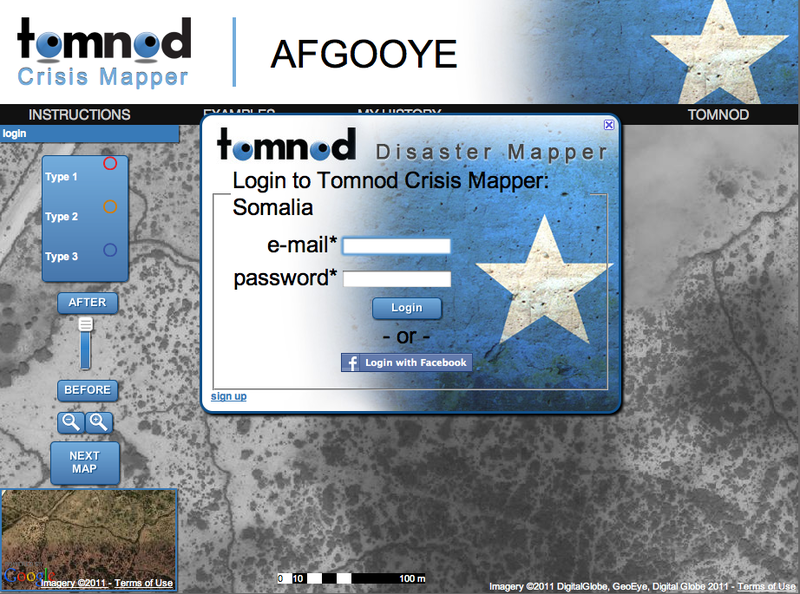 This entry was posted in Crisis Mapping, Crowdsourcing, Humanitarian Technologies, Satellite Imagery and tagged Imagery, Satellite, SBTF, Somalia, Tomnod, UNHCR. Bookmark the permalink.